Brandon ‘Lil’ Beast’ Laroco (3-1) discusses his upcoming fight against John Cardenas (2-0) at Dragon House 28. ‘Lil’ Beast’ has proven to be a monster in both the bantamweight and featherweight division. During this episode, Laroco, a proud representative of Combat Fitness-Rapacaon’s Martial Arts, possesses a fan-friendly, flashy style, and he touches on his technique, training, and much more. Episode 125 of the @norcalfightmma Podcast is also available on SoundCloud (link here). Follow Brandon Laroco on Instagram (link here). Follow Dave Madden on Twitter at (link here). Waxing the City (link here). Iron Bunny Supply (link here). My MMA News (link here). 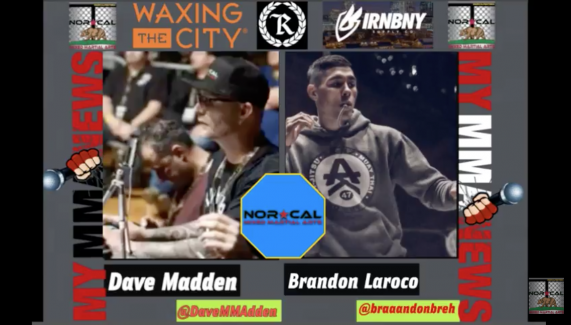 Please give this episode a thumbs up and don’t forget to hit the ‘Subscribe’ button to meet all the talented personalities surrounding NorCal’s MMA scene. Chasing cages across Northern, California and owner of norcalmixedmartialarts.com.